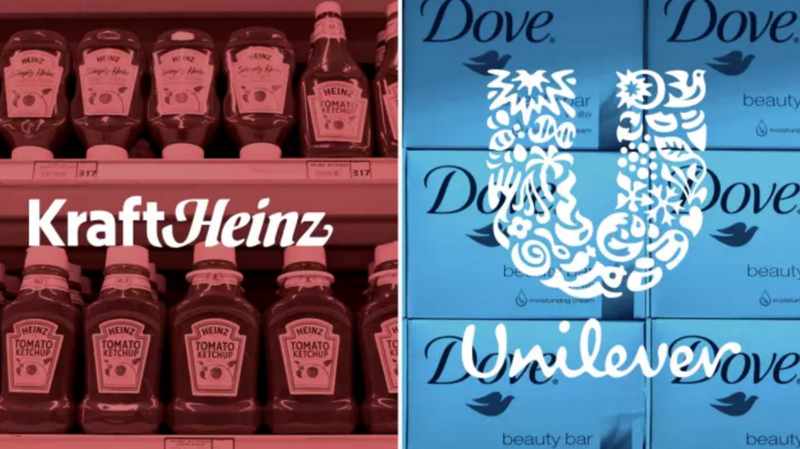 Kraft Heinz’s Ambitious Bid for Unilever: Why Did They Do It, and Why Did It Fail? di Bocconi Students Investment Club 2 Marzo 2017 8 min. On February 17, 2017, it was reported that Kraft Heinz had made a £112bn ($143bn) takeover offer for the Anglo-Dutch conglomerate, Unilever. A deal would have created the world’s second largest consumer company by revenues. Had it been successful, the transaction would have more than tripled Kraft-Heinz’s last year’s annual sales of $26.5bn and would have provided the US-based group with a deeper reach into emerging markets where Unilever holds a strong position. Only two days after publicly confirming its interest, Kraft Heinz dropped its $143bn pursuit as its main shareholders, Warren Buffett and 3G Capital’s Jorge Paulo Lemann, concluded that prolonged public battle would have caused more damage than good. Following this announcement, shares of Unilever fell 8 per cent. The Kraft Heinz Company was established in 2015 through the merger of Kraft Foods Group and Heinz. The merger was backed by Berkshire Hathaway and 3G Capital. The firm currently is co-headquartered in Chicago, Illinois and Pittsburgh, Pennsylvania and has a portfolio of more than 200 brands sold in nearly 200 countries. 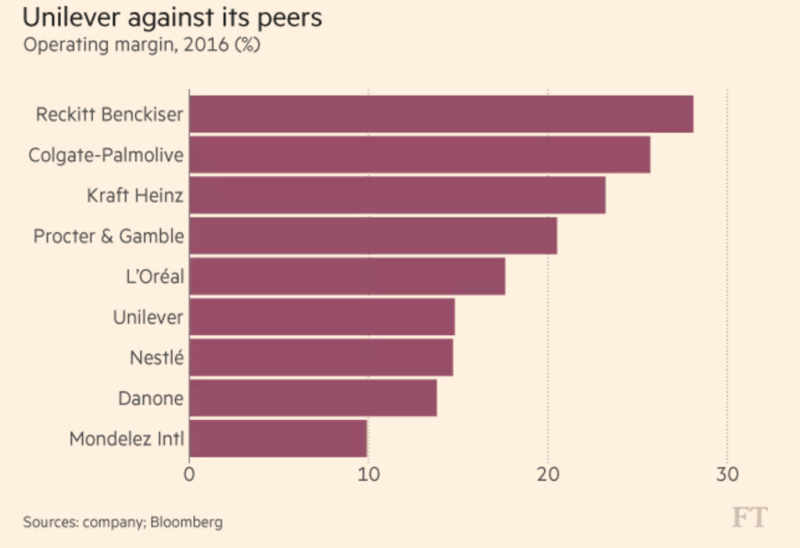 Kraft-Heinz is widely known for their portfolio of brands that includes eight brands with $1bn or more of annual revenues each. Timeline below shows evolution of Kraft Foods from 2010 until now. In FY2016, the company reported $26.5bn of total revenues (44.4% YoY growth), operating income of $6.1bn (132.7% YoY growth), and net income of $3.5bn, a significant improvement from last year’s loss of $266m. Unilever PLC is a dual-listed Anglo-Dutch multinational consumer goods company founded in 1930 through the merger of Dutch Margarine, Margarine Unie, and the British soap maker – Lever Brothers. The firm is co-headquartered in Rotterdam, Netherlands and London, UK. Unilever has a global footprint with more than 400 brands that are available in c. 190 countries. Moreover, it has subsidiaries in nearly 100 countries. The company has thirteen major brands with €1bn or more of annual revenues each. Unilever is organised into four main divisions: (1) Foods, (2) Refreshment (beverages and ice cream), (3) Home Care, (4) Personal Care. In 2015, the company shifted focus towards health and beauty products, away from food brands that had shown limited growth opportunity. Aligned with this strategy, in July 2016, Unilever bought the US start-up Dollar Shave Club for a reported $1bn (£764m) in cash to compete in the male grooming market. In FY2016, the company reported €52.7bn of total revenues (1.0% YoY decline), operating profit of €7.8bn (3.8% YoY growth), and net profit of €5.5bn (5.5% YoY growth). On the Kraft Heinz side, two figures loomed over the deal: Berkshire Hathaway’s iconic founder and CEO – Warren Buffett, and 3G Capital’s founding partner – Jorge Paulo Lemann. The partnership between Buffett and Lemann goes back to 3G Capital’s acquisition of Heinz, a classic example of 3G’s playbook of acquiring household name companies in debt-fuelled transactions and aggressively cutting costs afterwards. When there are no longer costs to be cut down internally, 3G looks for potential mergers with industry competitors, specifically targeting cost synergies. However, bidding for rivals is often complicated due to the unwillingness of the targets to be acquired. Furthermore, whenever teaming up with Warren Buffett, 3G cannot pursue hostile takeovers, as Buffett is well-known to dislike this type of deal making. With reports that 3G Capital had $15bn cash available, it had been long expected by industry analysts that Kraft Heinz would have attempted a major deal with other industry competitors such Mondelēz, General Mills, Pepsi, or Unilever. On the Unilever side, the key figure has been the company’s CEO, Paul Polman – who, over the past years, has tried to lead the company to a sustainable growth path. While prudent, this path resulted in Unilever achieving very modest if not sluggish performance, as shown by 2016 operating margin of 15.3%, compared to Kraft Heinz’ 22.55%, Procter & Gamble’s 20.58%, or L’Oréal’s 17.4%. So far shareholders have put up with the disappointing performance, but after the failed takeover attempt, Polman will need a new strategy to keep shareholders content.